I am a great believer in buying it when you see it. This is a philosophy that holds true for most of my purchases in life but especially for fabric. This week was of course the long-awaited Harrogate Knitting and Stitching Show which I visited with three friends. I made a few (ahem!) purchases – mainly of Xmas fabric again – it is just this time of year, they are all out there and so lovely you just have to. I think if you like it you should buy it and then you can later think about what you might do with it. I do buy some things with a project in mind – mainly my wool but most of my fabric is bought because I really like it and then later it finds its way into a project – such as my friend’s sewing box a couple of weeks ago. 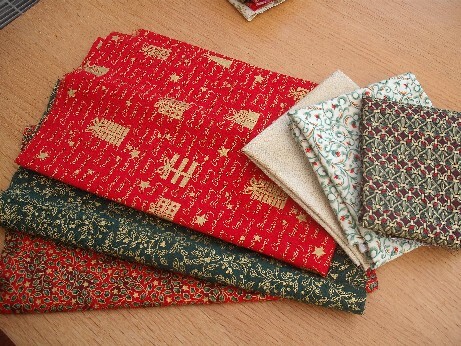 Did not find the Florentine fabric that I used for my friend’s sewing box but these are other fabrics from the same designer Robert Kaufman available from the lovely Sue at Springwood House Designs. 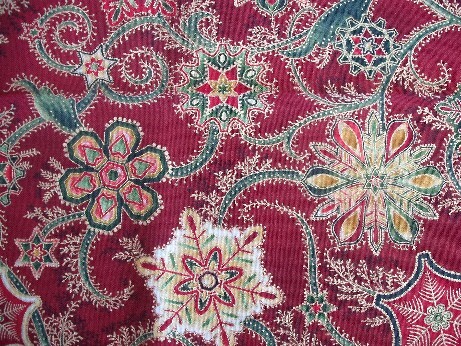 Here is a close up of the red – I can see this coming in handy for lots of projects. 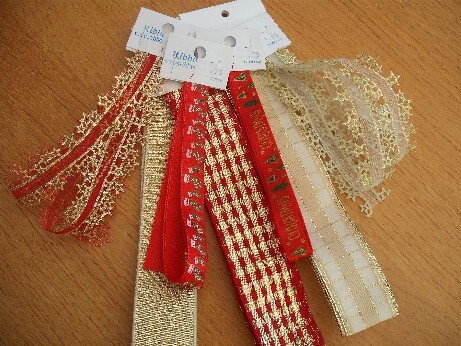 Also bought some more lovely ribbons from Sue and other suppliers for my baubles and pine cones. 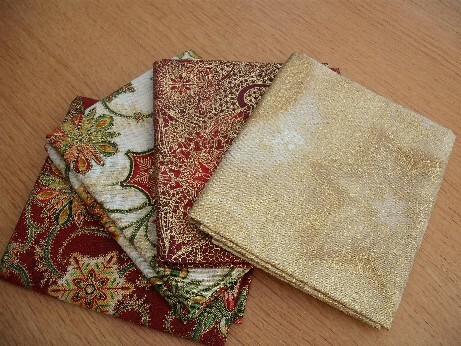 There were also a few bits of very traditional Xmas fabric bought – these will not be used this year but will be next. There were so many lovely things – next year I am definitely going to go for two days – one is not nearly enough as we only got to whizz round the exhibition bits where all the students’ work is and I love that. Lovely daughter Ellie has been home for the weekend and she has been helping my get ready for my Xmas Craft Fair at Oakwell Hall next weekend. I am very excited about this – my first real venture with my own designs! 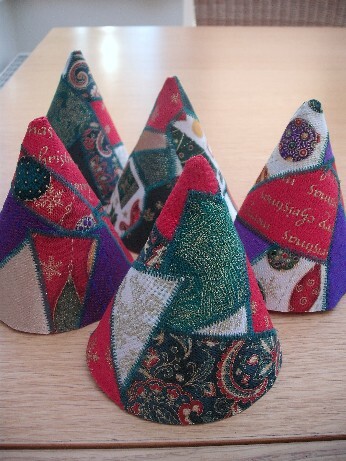 Here are another batch of my tree ornies – I have been sewing the braid on these this evening. Xmas trees or festive hats for gnomes! I have also made a new batch of Xmas fabric gift bags – thanks to Ellie for sewing on all the ties – but the light was too dim when we finished to take a pic of these so that will have to wait till later. 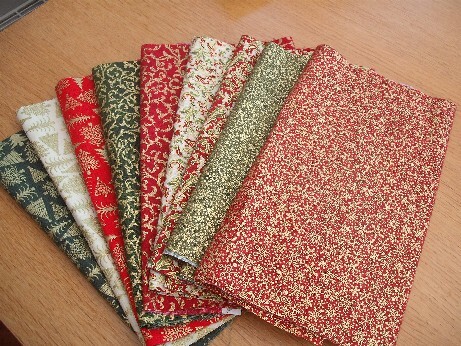 So a very lovely weekend and lots more lovely fabric to use! I love all your fabric Alison. If you do ever find another source for that Robert Kaufman Florentine fabric, please do tell us. I absolutely love it, and so does another reader of your blog (I won’t use her name without her permission) and we’ve been following your links to try and find some. Disappointingly, SpringWood House Designs has holographic fabric on her site, but nothing under “cotton fabrics”, because the ones you show are quite nice as well. Yes�I wish I knew where to get more. I suspect like a lot of the other fabric that I have got in previous years the manufacturers no longer make it- most of the Makower fabric lines have gone – and there were so many nice baubles on it :-(. Why don’t you save the pic of the fabric you like from my web site and e-mail it to Sue asking if you can have some. If you need more detail of any fabrics let me know and�I will take pics and mail them to you. She is a very lovely lady and I’m sure she would like to help. Please visit and leave a comment on my 3 year blogaversary giveaway post as well – am having a draw for that next Thurs.